$1,525 (plus shipping and crate). 119 years. The same family has owned the company throughout its life. I have been privileged to know these people and am honored to see my work hanging in their board room. The evolution of the marine spotlight has gone from a weak, dispersed light with little real distance distinction to the cold, intense long-distance beam shown in this painting. It is a night symbol of the river as you will often see aboard the American Queen. Just for fun, the beam in the image has been enhanced with luminescente paint to glow on its own, even after the lights have been turned down in the room. I enjoyed painting this work and spent an evening atop the machine shop of one of the Corps of Engineers buildings, looking for an idea that would speak to genuine rivermen. I have succeeded here and am proud to have created a work that will out live me. Real rivermen, with rough hands and a wealth of common sense, just love what I have accomplished here. 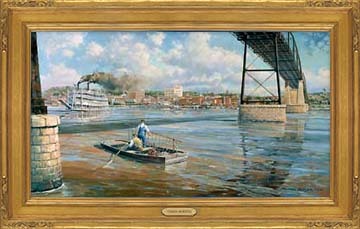 The painting isn’t of any single tow, rather any towboat from any firm on the inland rivers. and brass title plate: $1,450 (shipping and crate not included). The original oil painting used to create this print was over 2 & a half years in the making. It is a view seen only by the pigeon high above the Overview mansion. In this highly researched 1941 scene is old Davenport just before the Japanese sneak attack on Pearl Harbor in the Fall of '41. In the painting, the ferry steamer W.J. 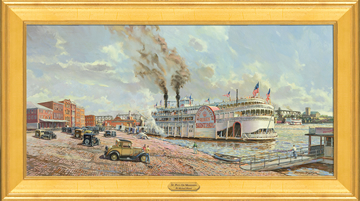 Quinlan is headed for the Davenport shore and the magnificent excursion palace J. S. Deluxe is edging in toward Davenport's levee. A sweeping panorama of the cities of Davenport, Iowa and Rock Island, Illinois looking downstream from the Clock Tower on Arsenal Island and the Government Bridge. 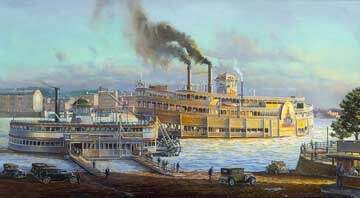 The steamer Lone Star was the last wooden hulled work-a-day stern wheeled steamer on the Upper Mississippi. She has been retired and is today a museum in the small river town of LeClaire, Iowa. The first bridge to cross the Mississippi River spanned from the Illinois shore at Rock Island, Illinois to Davenport on the Iowa side. This wooden structure was no small engineering feat for 1856. 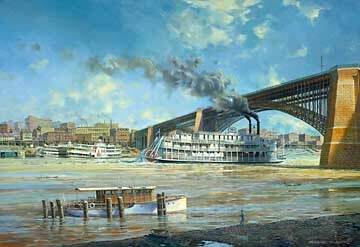 The bridge was opened in April of that year, andwithin two weeks, the now infamoussteamer EFFIE AFTON of Cincinnati,Ohio struck the bridge. She became wedged crosswise (sideways) under the draw span opening, then caught fire. In addition to the loss of the boat and its freight, the bridge lost two spans. At the time, the federal government suspected Southern sabotage because of growing unrest between the North and South. and the Cincinnati river pilot who had never seen a bridge before running the Afton into one. (shipping and crating not included). Named after Commodore John Streckfus, legend has it that the famous steamer J. S. was the root for the term jazz as the fleet often wintered in New Orleans and hired black bands to play their rhythmic melodies for the summer trade. I wanted to show a hot day, and it had to be from the summer of 1934. 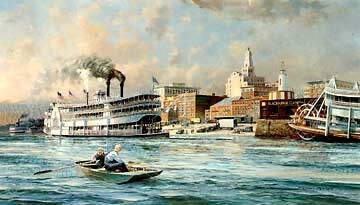 It was the only year the steamer ST. PAUL came to the Upper Mississippi River after the completion of the Lock and Dam at Rock Island. It was also the only year Captain Frederick Way Jr. was pilot for Vern Streckfus. I knew Capt. Way, so I came by the tale personally. 1882 by legendary businessman Diamond Jo Reynolds for the St. Louis New Orleans packet trade. She lasted as a packet until 1911, when Streckfus Steamers bought her. Commodore John Streckfus supervised the stripping of her passenger cabins in the slough behind Credit Island in Davenport, Iowa. He converted her to an excursion steamer with a vast dance floor, open deck, arcades and dining facilities throughout the boat. Mostly the ST. PAUL ran the harbor cruises in St. Louis. When one of the other Streckfus Steamers was laid up for repairs, ST. PAUL would take her place. In 1937, she was sent to Pittsburgh for repair and renamed SENATOR. 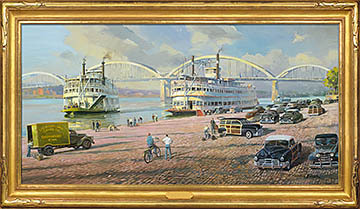 She remained in the Ohio River Excursion trade until she was retired in 1943. Her stripped hull was abandoned below St. Louis in 1953. There is something so lovely and evenly balanced about this painting. When I painted it, I did so without first studying her. But it flowed from my brush like it wanted to be seen, which really represents what I wanted to do when I first picked up a paint brush. plus frame: $1,450 (plus shipping and crate). The Captiol began her career as the Pittsburgh. She was eventually purchased by Streckfus Steamers and converted from a packet to the excursion trade making short cruises from the St. Paul levee. The steamer J. S. arriving in Davenport in 1938. 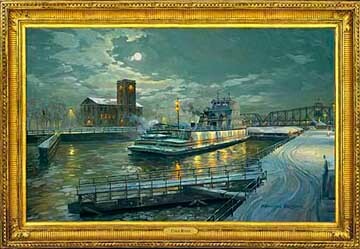 This limited edition fine art print is a pictorial record of Bettendorf in the late 1950's. 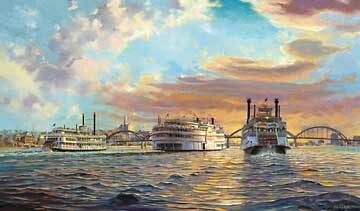 Shown in the painting are the steamer Lone Star, Avalon (now the Belle of Louisville) and the Alter towboat Frank R. Alter. The celebration of the first anniversary of riverboat gambling in Iowa was one the most interesting days in my career. I had the privilege of choreographing a ballet of half a million tons of riverboats via marine radio just downstream of the Centennial Bridge connecting Rock Island, Illinois and Davenport, Iowa on the Upper Mississippi River. 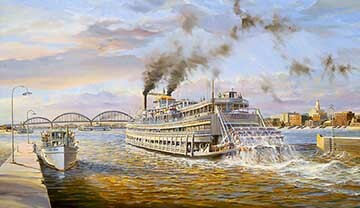 The steamer Delta Queen made her first voyage up the Mississippi River in 1954 heading to St. Paul. 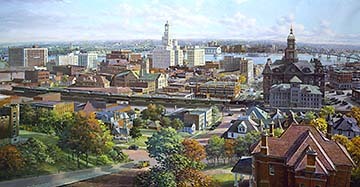 The City of Davenport is depicted in the background as it appeared in 1954. 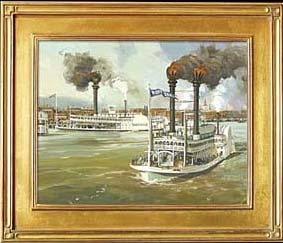 The steamer Avalon (now the Belle of Louisville) was based in Cincinnati, Ohio operating excursions on the Mississippi, Missouri and Kanawha Rivers. 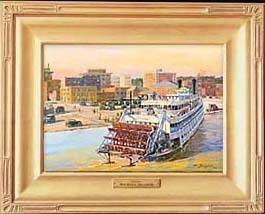 The artist had his first steamboat ride on the Avalon in 1954. The excursion steamer Capital at the Davenport levee 1928. Louis Armstrong and his band first came upriver from New Orleans aboard her. La Crosse Foundation and the Murphy Library. Proceeds from the sale of the prints will go to the Murphy Library Endowment Fund which supports and enhances the library collections and services. 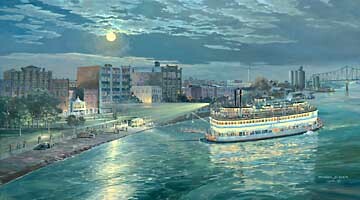 In our painting the excursion vessel Avalon is shown coming into Riverside Park in La Crosse on a warm summer evening. commerce on our inland rivers system. brass title plaque: (shipping included). By the early 1900's, two-thirds of the pearl buttons produced in the United States came from fresh water pearls. Iowa factories accounted for 39% of the nation's production and were among the top three largest producing states (New York and New Jersey completed the trio). This classic Muscatine Portrait looks back to the summer of 1919. The period clam scows and the old High Bridge frame this beautiful Mississippi River town. 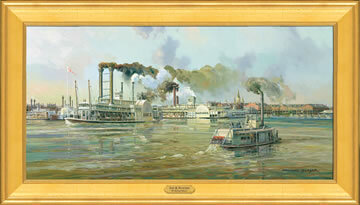 The Streckfus steamer Capitol is shown leavin. 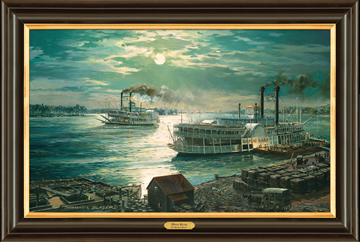 Frame denotes print available as Giclee on canvas BELLE MEMPHIS and BAYOU SARA pose for the artist on a moonlit night along the Lower Mississippi. The formal “CITY OF” always appeared ahead of the name, but crews often substituted, such as in the case of CITY OF MEMPHIS. It became known to all on the river as BELLE MEMPHIS. The BELLE MEMPHIS was snagged and damaged beyond repair. The BAYOU SARA was lost to fire on the levee at New Madrid, Missouri. New Orleans is an intricate web of exotic names, larger than life people and architecture found nowhere else in America. Restaurants excel just to survive. Creole cooking finds a way to remix ingredients in a very special way. This is all bound together in a love/hate/fear relationship with the Mississippi River and the storms that come rolling in off the Gulf of Mexico. 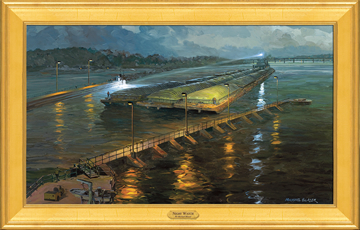 Huge levees usually keep the river where it belongs and serve to separate the two so capturing both by the hand of the artist is no small feat. In the scene we are looking toward the river down St. Peter Street. Crossing in front of the Cathedral is Chartres Street. Off in the distance are the Steamers NATCHEZ & DELTA QUEEN. To the left is Cafe Du Monde. 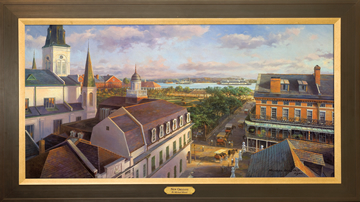 Flanking Jackson Square are the Pontalba Apartments West & East. In the lower right is the Petite Theatre. Across St. Peter is the Spanish Cabildo and next to it is the creamy white stucco of St. Louis Cathedral. All of these names are familiar to those who live in the city or love to visit (me). In reality the seawall (levee) in front of Jackson square across Decatur Street is much larger than painted. sized 26 X 50 inches plus frame with brass title plate. The pride of the New Orleans waterfront, the steamer Natchez is shown signaling the barque rigges Elissa of Galveston who has been a frequent visitor to New Orleans. 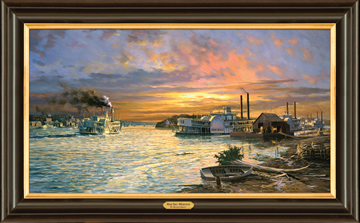 Signed and numbered prints will be countersigned by Captain Clarke C. “Doc” Hawley who was the first Captain on the Natchez untila few years ago. History was made and a considerable amount of money exchanged hands on June 30, 1870 when the great steamboat race occurred between the famous racer Robt't. 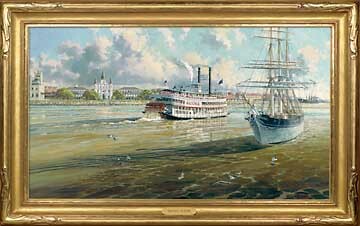 E. Lee and the packet steamer Natchez. The only time the two boats were together was when they left New Orleans heading to St. Louis. The Natchez broke a water pump and they were never again in sight of one another. This is a study for a major oil painting coming from the artist's easel this fall. The end of the season on the Upper River can be cold, icy and unforgiving. Every river man knows what it's like. The monolithic structure of the old Clock Tower provides a reassuring presence on a snowy December night as a lone towboat locks thru heading south at season's end. It was 1933 just yesterday. 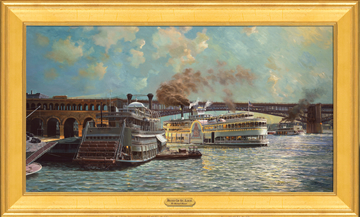 The Dixieland jazz from the dance floor can almost be heard as the magnificent J. S. backs away from the STRECKFUS landing just below the Eads Bridge in St Louis. In the foreground, the massive steamer CAPITOL lies darkened as she is updated for the coming season of “tramping” on the Upper Mississippi. The J. S. originally came out as the QUINCY, built for the Diamond Jo Lines in Dubuque, Iowa in 1896. She was converted to an excursion boat by the Streckfus family, who bought her in 1911. Much of her career was spent doing “Moonlight Cruises” in the port of St. Louis. Every few years, she “tramped” to the Ohio or the Upper Mississippi. The boat was named after John Streckfus. He took great pride in her upkeep. He even had the beam of the stern narrowed considerably to give her the look of a sleek Hudson River Steamer. Romantics believe that a boat can live on forever, but it is not so. The J. S. lasted until 1939, her wooden hull having seen all the stress it could take. with brass name plate: $,1450 (plus shipping and crate). brass title plate: $825 (shipping included). 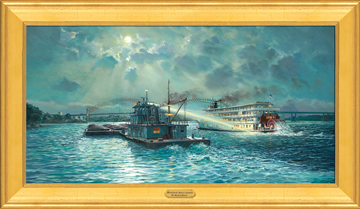 The steamer Golden Eagle came to symbolize the twilight of St. Louis' great maritime heritage. The Golden Eagle was owned by the Eagle Packet Company of St. Louis until 1944. The pilot house is preserved at the Jeffersonal Memorial in St. Louis. 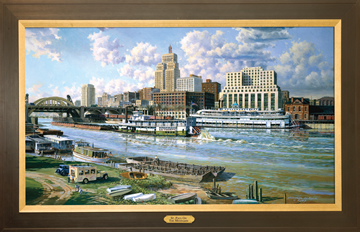 It would be easy today to recognize the same characteristic skyline in St. Paul as it appeared from the Mississippi River in 1935. The Robert Street Bridge, the Post Office and the First National Bank still dominate the skyline when viewed from the south. Steam power was still the primary means of commercial power on rail and on the water. The stern-wheeled towboat S. S. THORPE, of Inland Waterways Corp., pushes a load of coal upstream. By this time, most barge construction was of steel. The famed excursion steamer CAPITOL is awaiting passengers at Jackson St. Landing. The foreground sports boats from the nationally known St. Paul Yacht Club. This club boasts the largest fleet of privately owned stern- wheeled boats on the Mississippi River.